More recently however, dentists have begun to rely on 3D imaging techniques and cone beam scans to provide them with a detailed view of the mouth and skull. The advantage that 3D imaging holds over regular dental x-rays is that the bone structure, bone density, tissues and nerves can be viewed clearly. 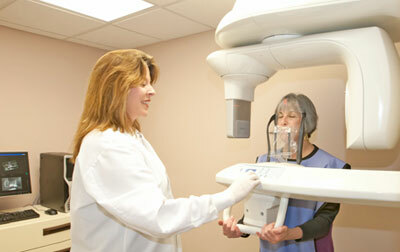 Our practice currently uses the Carestream® 9300 cone beam scanner which can complete a scan in less than 15 seconds. This minimal radiation, high resolution cone beams scanner can generate extremely accurate 3D images but can also produce incredible 2D panoramic images with significantly less radiation than older panoramic units. This means that far less radiation enters the body than if a regular set of bitewing or full mouth series x-rays were taken. Cone beam scans are an invaluable aid in planning dental implant treatment and also assist in the diagnosis and treatment of congenital, acquired, and developmental abnormalities of the maxillofacial area. Dental implants are the most sophisticated replacement option for missing teeth, but have historically proven to be time-consuming to place. 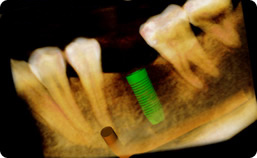 Cone beam scans vastly reduce the time it takes to implant teeth and will likely enhance the success rate of implant procedures due to improved treatment planning accuracy. How are cone beam scans used? 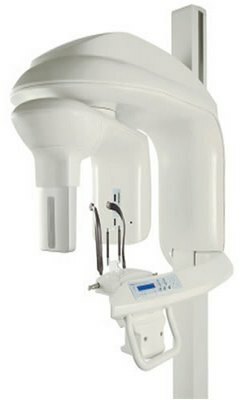 Cone beam scans are advantageous because they allow the dentist to magnify specific areas of the face. In addition, the dentist can easily view cross-sectional “slices” of the jaw, which makes planning treatment easier and faster. How are cone beam scans performed? Cone beam scans are quick and simple to perform. A Cone Beam Imaging System is at the heart of the Carestream® 9300 scanner. During the scan, the patient is able to stand or sit in a chair or wheelchair. A simple 12 second cone beam scan can generate literally hundreds of high resolution images of the face. These pictures are used to compile an exact 3D image of the inner mechanisms of the face and jaw. The oral surgeon is able to zoom in on specific areas and view them from alternate angles. Previous patients report that the Carestream® scanner is comfortable because the scanner provides an open environment, meaning that claustrophobic feelings are eliminated. The Carestream® 9300 scanner is an incredible tool that is minimizing the cost of oral and maxillofacial surgery treatment, reducing treatment time, and enhancing the end results of oral and maxillofacial surgery. If you have questions about our Carestream® 9300 scanner or 3D imaging, please contact our office.